Recently I shared a post on my Facebook page that featured a list of books with strong female characters. In response to that post, I had a reader comment that there were so many similar lists featuring girls around at the moment, but little for boys. 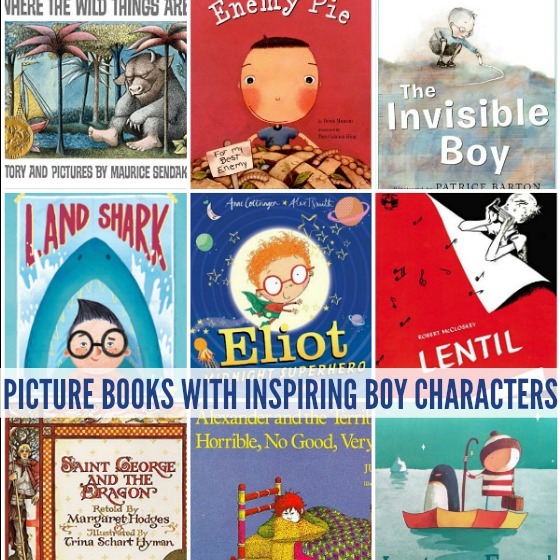 She asked for suggestions for books featuring positive boy role models, and I in turn asked some of my blogging buddies and the followers of the Facebook page too. So today’s list features all sorts of boys – some are strong, some are brave, some are creative, some are inquisitive, some are imaginative, some are quiet, some are loud. What they all are are boys learning important life lessons about being human. I have purposely included books featuring human boys – not older or adult males, not animal or other male creatures but boys. 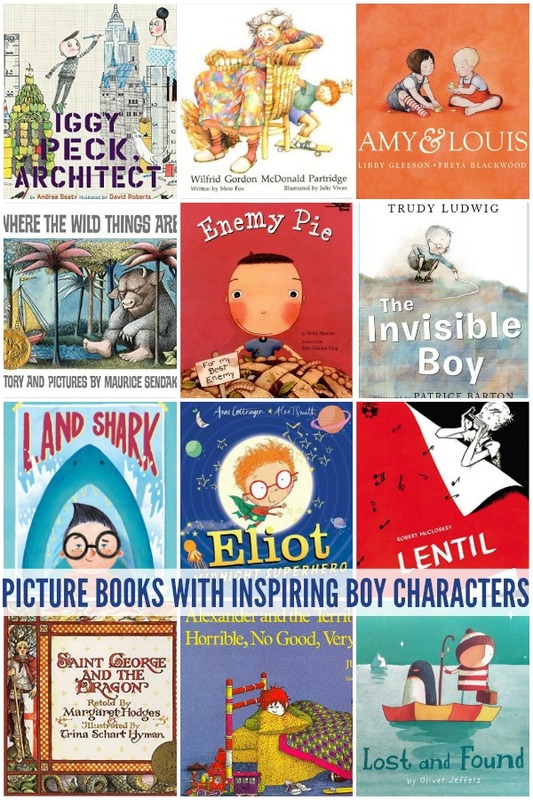 And while these are all picture books, there is a similar chapter book list in progress…watch this space! Where the Wild Things Are by Maurice Sendak: A celebration of emotions, imagination, melodrama and the power of home. Lentil by Robert McCloskey: Lentil longs to sing but he cannot sing or even whistle, so he buys himself with a harmonica and practices constantly wherever he is, through dedication Lentil’s harmonica playing saves the day when calamity threatens his hometown. The Invisible Boy by Trudy Ludwig: A celebration of small acts of kindness and recognition of the needs of the quiet children within our circles. Enemy Pie by Derek Munsen: A wonderful story about the importance of not judging others and the important components of friendship. Alexander and the Terrible, Horrible, No Good, Very Bad Day by Judith Voirst: Alexander is a character children can relate to – after all we all have bad days! Iggy Peck, Architect by Andrea Beatty: A fabulous book about believing in yourself and staying true to your dreams. Saint George and the Dragon by Margaret Hodges: Saint George, the Red Cross Knight, is taken by the lady Una to her parents’ kingdom, where in a mighty battle he slays a dragon who terrorises the land. Lost and Found by Oliver Jeffers: A boy discovers a penguin on his doorstep and figuring the penguin must be lost sets out to find the penguin’s home, and so begins a journey of determination and friendship. Eliot, Midnight Superhero: Eliot is a quiet child by day because he’s exhausted from saving people every night! And now he is on a mission to save the world! Millie, Jack and the Dancing Cat by Stephen Michael King: A fabulous story about learning to love what makes you uniquely you – I love that Jack follows his dreams and inspires Millie to do the same. Land Shark by Beth Ferry: The only thing Bobby wants for his birthday is a pet shark. So you can imagine his disappointment when his parents get him a puppy! Harry and the Bucketful of Dinosaurs by Ian Whybrow: When Harry loses his beloved bucketful of dinosaurs on a train ride, he must prove they are his before reclaiming them from Lost and Found. Ish by Peter H. Reynolds: Ramon loves to draw until a careless comment makes him lose confidence in his ability. Ramon learns that the beauty of creativity is in the process, not the finished product. Amy & Louis by Libby Gleeson: Amy and Louis are next door neighbours and best of friends until Amy’s family moves half a world away. Louis sets out to find a way for them to maintain their special bond. Wilfred Gordon McDonald Partridge by Margaret Wild: Wilfrid Gordon McDonald Partridge lives next door to a nursing home in which resides Miss Nancy Alison Delacourt Cooper, his favorite friend, because she has four names as well. When Miss Nancy “loses” her memory, the intrepid Wilfrid sets out to find it for her. As always, the titles are lined to online bookstore pages (these are affiliate links). I suggest that you read reviews and recommendations for those you might not be personally familiar with. Do you have any title suggestions to add to our list? Great list! We also love The Boy Who Grew Flowers as an example of a sensitive, compassionate boy.